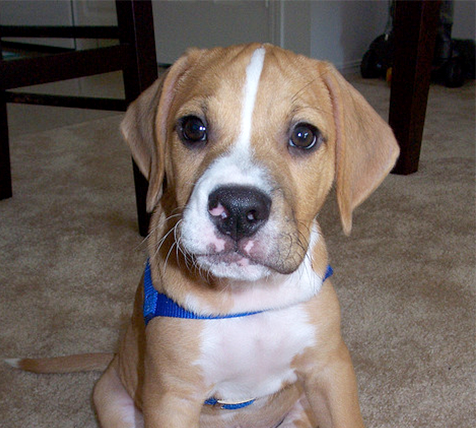 The Beabull is a medium to large dog of solid build that is both cute, playful and hardy. The appearance of each dog can vary considerably, depending on the parent’s genetic contribution. Some look more Beagle, while others can have a definite stocky Bulldog appearance. They have a strong lean body with typical hips much like their Bulldog parent. Their tails and legs are short. The floppy ears are reminiscent of the Beagle, and the Beabulls face has a few wrinkles and wide-set deep brown to hazel eyes. Their long muzzle sports a black nose with wide nostrils and the dogs often have a strong underbite in the jaw. Their hair coat is short haired and coarse and can be high shedding which needs extra brushing to remove it. They are well-tempered, loyal, and very lovable dogs. The Beabull is a friendly and patient dog with children and other animals including dogs. They are intelligent and even tempered, although they can have a streak of stubbornness from the Bulldog side. While they are not very active dogs, they will enjoy a game or walk to burn off their energy. Loveable and loyal, the Beabull is gaining a good following who love the mischievous affectionate nature of this dog.